Ohio Valley Christian School’s Laura Young (11) goes up for a kill attempt during the Lady Defenders’ volleyball match against Point Pleasant on Thursday in Gallipolis, Ohio. GALLIPOLIS, Ohio — With Point Pleasant checking off the boxes of all of its advantages on Thursday, the Lady Knights needed simply to take of business. Those Lady Knights — taller, stronger, deeper, more experienced and just more talented — did just that against the host Ohio Valley Christian School Defenders, sweeping OVCS 25-14, 25-11 and 25-19 on the volleyball floor in Gallia County. The match went just about as expected, although the Defenders did do some good things, and played Point Pleasant especially tough in the final game. In fact, OVCS scored the opening three points, led as late as 5-4, and only trailed 21-18 after a pair of Lady Knight attack errors sandwiched around a Cori Hutchison ace. But a pair of kills by Brenna Dotson and one by Olivia Dotson, along with an ace by Madison Hatfield, gave PPHS four of the final five points for the hour-long straight-game sweep. With the victory, the Lady Knights raised their record to 13-3, as they rebounded from a four-game loss at Warren on Tuesday. The Lady Defenders, which hosted Covenant Christian for Senior Night on Friday, slipped to 6-8. For the Lady Knights, their sheer size, strength and power allowed them to hammer down a multitude of kills. Brenna Dotson delivered a match-high 15 with one solo block, while Lenea Cochran chipped in 11 and Olivia Dotson nailed nine. Gracie Cottrill collected four kills in the effort. 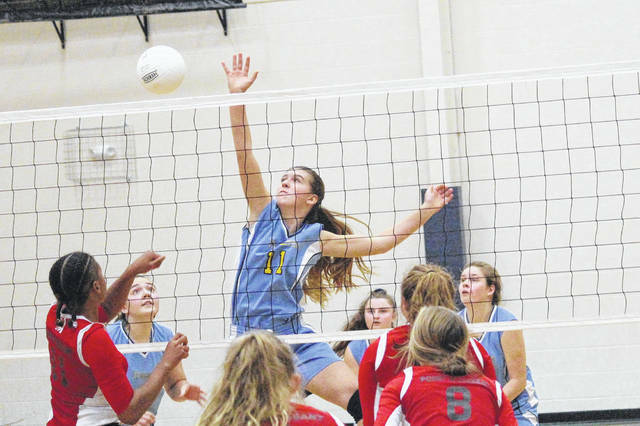 Nine of Brenna Dotson’s kills came in the third game, as she, Cochran and Olivia Dotson all had four in the first —while Cochran came up with four more in the last. Cottrill in the third, Peyton Jordan in the opener and Mackenzie Freeman in the middle amassed a pair of aces. The Lady Knights never trailed in the opening game, as a Katie Westfall kill got the Defenders to as close as they would get the entire set (2-1). A pair of Jordan aces, as part of four straight service points, made it 7-2 —as Marcie Kessinger’s kill got OVCS no closer than 7-3. In the second game, Westfall opened with a kill, but a Cochran kill for the 1-1 tie and Freeman’s three straight service points forged a 4-1 advantage. A pair of hitting errors allowed the Defenders to get within 4-3, but Jordan reached the service line again —and served for six consecutive points. The Defenders did score three of the next four points to trim the deficit in half (12-6), but got no closer. In the third set, after OVCS opened with a 3-0 advantage, the Lady Knights notched 13 of the next 18 points to gain control. The final of Westfall’s eight kills, along with a pair of Point Pleasant errors, made it 13-11 — but the Lady Knights never let the Defenders get closer from there. Westfall finished with three kills apiece in the opening and closing sets, while Emily Childers contributed with two kills and an ace in the third. That something big for OVCS, following Friday night’s Senior Night for Hutchison and Westfall, was an Ohio Christian School Athletic Association tournament tilt on Saturday. The second-seeded Defenders hosted third-seeded Genoa Christian, as OVCS is actually the defending OCSAA state runner-up. Point Pleasant returns home, and returns to action on Monday, when it hosts Mason County rival Wahama.